Top 10 Foods good for brain before taking a test - Healthy food for Brain! Top 10 Foods good for brain before taking a test – Healthy foods to boost your brain power! Final weeks put students under a lot of pressure as endless exams and papers are coming like storms. For most students, exams appear to be like bad nightmares when lack of sleep and the intense workload mess up their lifestyles and drain the energy out of them. It is necessary to provide oneself with sufficient nutrients at this stage to nourish the brain and body. Unfortunately, it is a common misconception as students mostly rely on junk food, energy drink, or coffee to keep their energy up while expecting better mental performance. However, exams do not need to be unhealthy. In fact, a healthy and nutritious diet plan is a must for excellent exam performance. Brain foods are a highly-recommended reference for anyone who needs to survive the exam period with limited time to spend on meals. As the name says itself, brain foods are food high in nutrients, fat, vitamins, minerals, and antioxidants, which are beneficial for brain functions. They could boost memory, enhance concentration ability, and help you perform exams better. In the long term, brain foods are specifically helpful in preserving the brain from dangerous diseases. ‘An apple a day keeps the doctor away,’ the old proverb still holds its scientific meaning even now. The delicious fruit is not only rich in flavor but also antioxidants, dietary fiber, phytonutrients, vitamins, and minerals. Those nutrients are important in preventing the risks of many diseases, as well as nourishing the brain. It is believed that apple can improve cognitive performance, boost memory, and reduce anxiety. Eating apples regularly in the long term can even help to fight against Alzheimer’s disease. Different from most other fruits, an avocado is like a pack full of calories. As a consequent, avocado is often put in many people’s blacklist since they assume avocado is too fatty. However, in fact, the fat from avocado is mostly monounsaturated fat, which is considered to be healthy fat. In addition, an avocado provides a wide range of nutrients, which are beneficial to brain health. Thanks to those nutrients, sufficient blood and oxygen supply to the brain can be maintained, which will keep you more focused while improving decision-making and critical thinking skills. 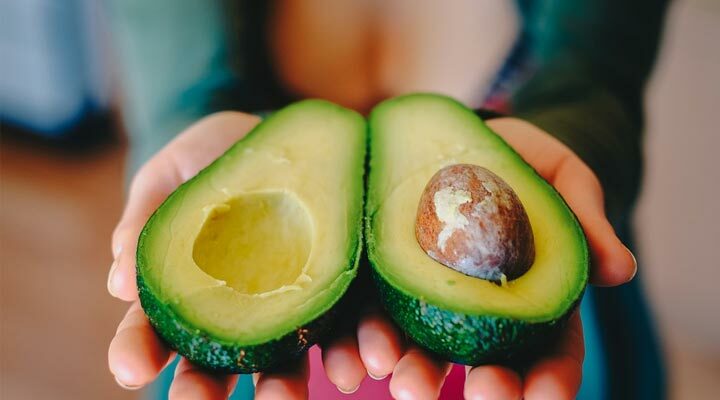 Avocado is also a rich source of vitamins, such as vitamin C, E, and K. It is highly recommended to have a quarter or half of an avocado per day. Avocado is one of the most recommend foods good for brain. It is commonly believed that eggs contain a high level of cholesterol, which is of great health problem concerns. However, recent studies have proven this otherwise. Eating eggs does not increase cholesterol level in the blood. Instead, it is even believed to raise the good cholesterol level, because cholesterol in food and blood is not the same thing. More importantly, scientists have discovered the high amount of choline contained in eggs. Choline is essential for brain functions as it stimulates brain cells’ communication and avoids memory loss. An adult who takes about one egg a day can perform better on memory tests. But, ì there are signs of increasing cholesterol level in the blood, it is recommended to cut down on the portion of eggs per day. Salmon is very rich in omega-3 fatty acids. Moreover, salmon is one of the animals we may most easily obtain these fatty acids from. These fats play a vital role in making new neural pathways. However, you have to temper consuming salmon because it has the risk of contamination. As you may know, all wild salmon have mercury due to waste dumped by humans. But, it is still healthier and better than farmed salmon, containing little omega-3 fatty acids. Dark greens contain nitrates and vitamin K. Naturally occurring nitrates in dark greens are bound to other essential nutrients, and they are healthy for your body systems. In fact, chemical nitrates, like what is found in preserved foods and lunch meats, ruin the blood-brain barrier. Not something that you want. Moreover, the vitamin K is essential for blood clotting. Also, it is one of the important nutrients for the development of new neuropath ways. Physically, you can learn as you have enough this vitamin in your system. Our brain utilizes sugar for fuel. Unluckily, the simple sugars in candy and sodas burn up far too fast to give you stable energy. Therefore, complex carbs are important for you. The Franklin Institute states that your brain requires twice the amount of fuel as the remaining parts of your body. One of the best sources of the energy is complex carbohydrates, including natural fruits, grains, and vegetables. Caffeine can help to provide a boost immediately before having an exam. However, don’t be tempted by energy drinks churning your stomach. Coffee is one of the best alternatives, but you should drink it with caution. Consuming too much of coffee could make you unable to focus, while getting dependent on it, in the long-run, makes you more fatigued. Besides, green tea is considered a good alternative to options with high contents of caffeine because it provides antioxidants and boosts your concentration. Fruit is one of the best brain foods to eat when you prepare for an exam. Blueberries are rich in antioxidants and other nutrients to keep your brain nourished and keep you focused. Moreover, bananas are a high source of protein that stabilizes the blood sugar levels for an increased concentration. Besides, the natural sugars in fruits offer the brain clean energy that does not see you crashing soon afterward like other sugary and artificial foods. Dark chocolate contains at least 75 percent cacao content and flavonoids that offer powerful antioxidant properties. This can reduce blood pressure and cholesterol level. One of the best benefits of dark chocolate is due to its natural stimulant: caffeine. It may help you to focus your energy. However, be careful when you drink it. Too much caffeine causes you to lose concentration and can work against you while you sit down to have a test. Therefore, eat only the dark chocolate. Never mix it with tea or coffee before your exam. If you need a food that is good for your brain, try snacking on broccoli. It is a good food after a brain injury because broccoli can repair neuron-connections and speed up the healing processes. Although studying is not the same as a traumatic brain injury, it may definitely feel this way sometimes. This guest post is by Emily Pham, a blogger on health and beauty issues.